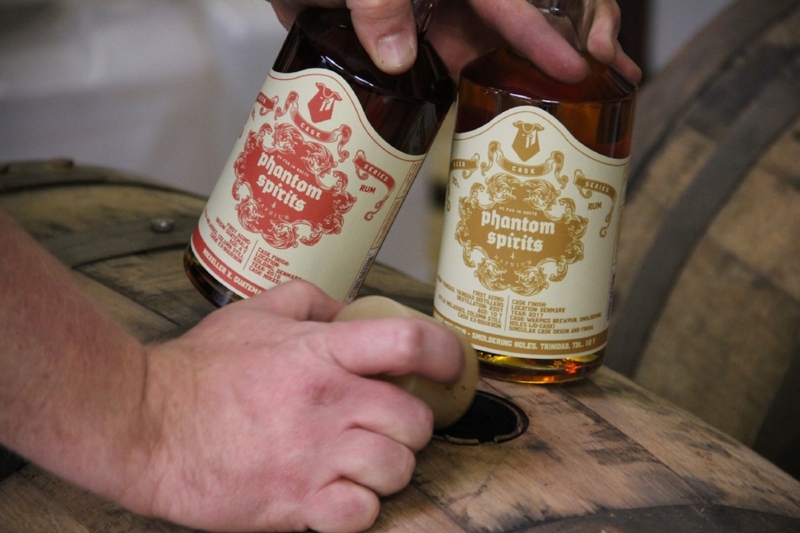 Spirit People - PHANTOM SPIRITS RUMS ARE ON OUR DOORSTEP! That is the maxim of Phantom Spirits; a Danish company specializing in cask finishes of rum from around Central America; and they are doing some seriously interesting experimentation. Their coat of arms lists "Ut Fur In Nocte" ~ "come as a thief in the night" (loose translation), and as clandestine bottlers, they walk their talk. Phantom collects these aged rums from various distilleries; from 4yo Guatemalan to 17yo Barbadan, and gives them a second ageing in barrels from a few local punk brewers. Beer cask finishes from smokey stouts, vanilla shakes and malty, hoppy froffies give these rums an incredible depth and expression unlike any other. We've been lucky enough to source the 4 main expressions of rum. - Smoldering Holes (JD Cask) has had a start as a 10yo Trinidad rum matured in ex-bourbon casks, then a polish in Warpigs' imperial stout from ex Jack Daniels casks. - Mikkeller Beer Geek Vanilla Shake brings a whole new flavour, using 4yo Guatemala rum finished in casks from an oatmeal stout brewed with coffee and vanilla. - Mikkeller X is another 4yo Guatemalan, this time finished in one of the experimental X-series beers from Mikkeller. These are some extremely rare and limited rums, there are no more than 3500 bottles of the entire range that exist world-wide. Keep your eyes on the site, and make sure you get on to our mailing list (found in the footer), to be the first to know when the bottles go up!